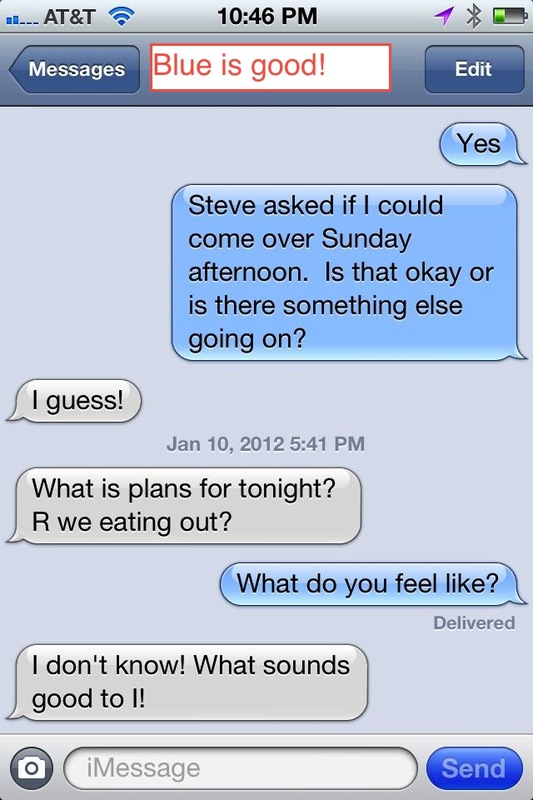 Danger Will Robinson – iMessage isn’t always free! Note to all my friends that have iPhones. You may be getting charged for iMessages that you thought were free. I just got my statement from AT&T and saw charges I didn’t expect for messages between my wife and I. This amounted to nearly $10 in extra charges just this month. Remember in your message app that if your message bubbles are blue, the iPhone is using iMessage and not traditional text/sms messages. 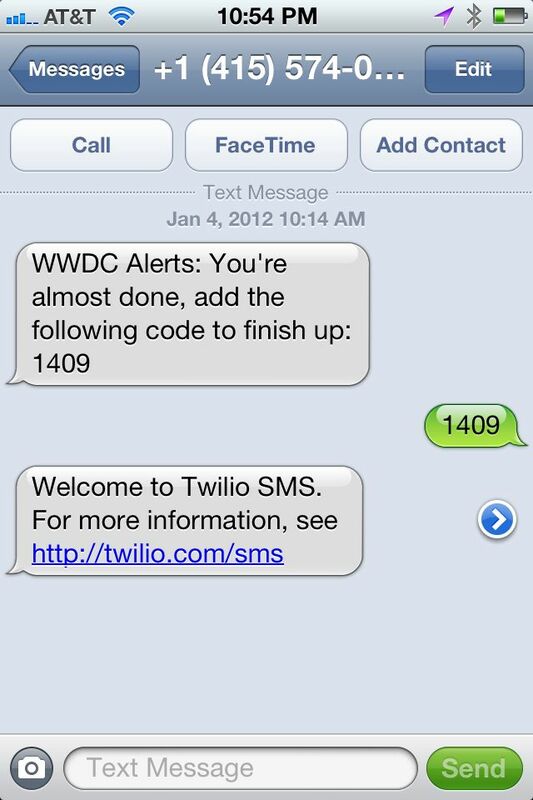 This is only available on iOS 5 and later and only when txt’ing with another iPhone user who has iMessage working. If you have an iPhone 4S you will be good! Older iPhones should be upgraded. However, you also need to make sure it is turned on for your phone. How will you know? If your message bubbles are green you are not using iMessage. iMessages are free because they are sent over your data plan. They can save you a ton of money. While researching these charges, I discovered that by default your iPhone will fall back to SMS if you are in an area where your data signal is restricted. Judging by the number of charges on my bill last month, this happens more than you might think! This can be quite misleading as you may see the familiar blue bubbles but still have a charge for it. I don’t know if this is a glitch as I would expect that the messaging app should turn those bubbles green in this case but it didn’t for me. 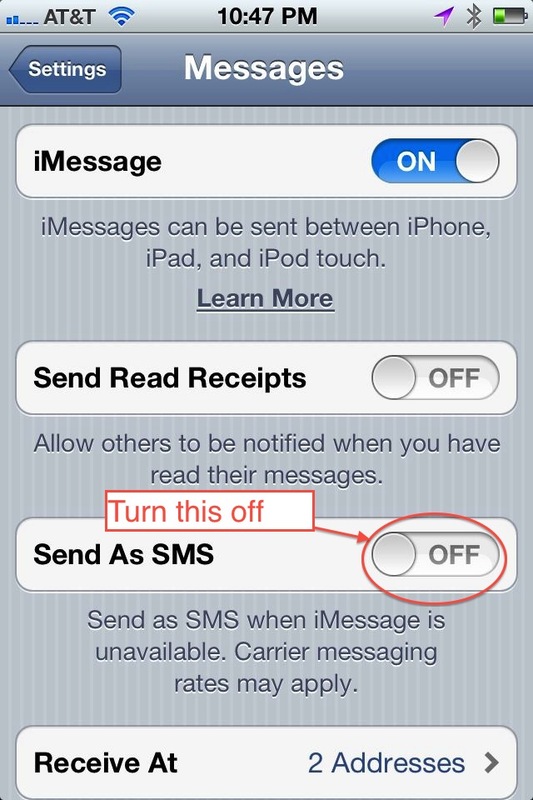 In order to turn this fall-back behavior off, you will need to go into the settings app and turn it off. Once in settings, scroll down to messages and then you will see the following screen. 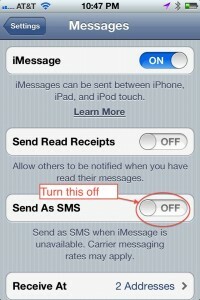 Turn off the “Send as SMS” option. Note that if you don’t care about saving money and always want your messages to be delivered regardless of how good your data signal is, go ahead and leave it on. Once I figured out what was going on, I called AT&T and experienced the best customer support I have ever had with them. They suggested that I might want to turn on “Messaging Block” to completely avoid any further charges like this. It is free to turn this on and it will block all further text messages on your phone. I immediately did this for all of the phones on our plan. She also offered to wave all fees that had been charged. Yippee!! Make sure your friends are using iMessage (if they don’t have an iPhone or don’t have it turned on) you won’t be able to use it with them and you will see green bubbles. Never pay for a text message when they should be free!. If you want to make sure you aren’t paying for ridiculously overpriced text messages, block them! 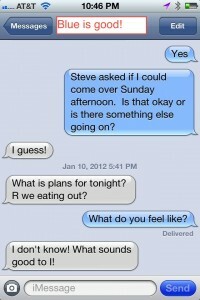 I use iMessage for my iPhone friends and Google Voice for my friends with other phones. For my non-iPhone friends, just use Google Voice for everything. Warning – Understand the risks – Make the educated choice as to whether you really want to turn off the SMS fallback option. If you want to guarantee that your messages are received (like for an emergency) you probably want to leave it on. 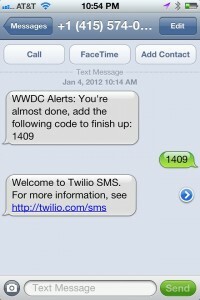 The reliability of messages sent over iMessage with the SMS fallback off is totally dependent on your data connection. If you OR your messaging buddy get into a dead zone where data is unavailable, messages could get lost. Ideally, it will queue these messages until you reach an area where data is available again. There is an option to send receipts if the message is received too. You can always turn this on for all of your family members and that will also help. Happy messaging! Posted on January 10, 2012 January 4, 2015 Categories Mobile Devices - primarily iOSTags Apple, AT&T, charges for iMessage, free text messages, iMessage, iMessage Charges, iOS5, iPhone, iPhone 4S, Messaging Block, Mobile Devices - primarily iOS, pay for iMessage, Saving Money, SMS, Text Messages, txt'ing12 Comments on Danger Will Robinson – iMessage isn’t always free!